For the first OAS General Assembly of his tenure at the State Department, Rex Tillerson is sending a surrogate. Today, Deputy Secretary of State John J. Sullivan led the U.S. delegation at the 47th Regular Session of the Organization of American States (OAS) General Assembly in Cancun, Mexico. In his remarks to 33 heads of delegation from Latin America, the Caribbean, and Canada, Deputy Secretary Sullivan outlined U.S. goals for engagement in the Americas for mutual security and shared prosperity, the principles and values we share with fellow OAS member states, and our support for collective OAS action when these principles and values are threatened, such as in Venezuela. It is not the first time that Tillerson has taken a back seat, and we can wager it will not be the last. Hillary Clinton, when she was secretary of state, often emphasized the importance of face-to-face meetings. It is no secret that the Trump administration plans to pare down the state department and de-emphasize diplomacy in general, but this kind of abdication of presence comes as a shock nevertheless. Multinational summits and assemblies are prime ground for networking among peers. For Tillerson to turn his back on 33 counterparts from our backyard smacks of lunkheaded isolationism on our part as a nation and betrays a dangerous consolidation of power and authority at the top. Foreign ministers and secretaries of state knew, when they met with Hillary Clinton and John Kerry, that major concerns voiced to them would be passed on to the president. Depriving these officials of the opportunity to meet with Tillerson eliminates an important conduit. Hillary Clinton’s first appearance at an OAS GA coincided with a push on that body’s part to readmit Cuba which Hillary opposed without strict conditions on human rights reform. She also, everywhere she went, made a point of meeting not only with officials but also with civic leaders and organizations. You can read about some of her Latin American diplomacy here. This was “smart power,” as Hillary dubbed it. At summits and assemblies, the presence of the top official is key. Seems now we are reverting to a counter-productive foreign policy. All power is consolidated in the man at the top and excludes his official top diplomat. This is the Trump Doctrine: Stupid Power. When I posted Tillerson’s Folly, my thinking was that, in barring the press from his first official trip, Rex Tillerson was alienating a potentially valuable set of allies. Brassy Rebel pointed out, in her comment there, that his attitude vis-à-vis the press might indicate a broader administration policy of downgrading diplomacy. Indeed, Trump’s cabinet picks in general seem to indicate antagonism toward the very departments these folks head. Hillary Clinton spent her first weeks at the State Department roaming the halls when she had a chance and popping into offices to ask what the folks there did. Foreign Policy‘s article by Robert Jervis, presents a secretary of state cut off from others in the building and even from the Oval Office. Remember when everyone said Hillary got off on the wrong foot with Russian Foreign Minister Sergei Lavrov with her reset button? She did go on to work very successfully with him on New START, didn’t she? Did you wonder when Tillerson was going to meet with Lavrov? Well, according to Jervis, he already has and that did not go swimmingly. A minor indicator was his ignorance of the protocol to be followed when he met his Russian counterpart and neglected to make the standard introductory remarks. This shows that Tillerson was disconnected from his building’s expertise, that he ignored what he was told, or that his subordinates went out of their way to embarrass him. The reason we did not know about it, of course, is the absence of press and paucity of press briefings under Tillerson. Here is the schedule for March so far. There was no briefing today. In contrast, here is the schedule for January – the last three weeks of John Kerry’s tenure. Here is the schedule for March 2012, five years ago this month and the last year Hillary was secretary of state. There is definitely something going on there. Mark Toner is still the spokesperson, but he is speaking far less these days than under Hillary and John Kerry. It is also a little odd that Tillerson has not appointed his own spokesperson. Jervis’s analysis is well worth a read. He takes a broad look at Tillerson’s State Department and his conclusions bode ill for the department and for diplomacy. It reminds me of George W. Bush appointing Christie Whitman to head the EPA and then knee-capping her at every turn. She finally left in frustration after only two-and-a-half years. Fine thanks for giving him Barney! There are five avenues to power at Foggy Bottom, and they’re all blocked to the current man in charge. 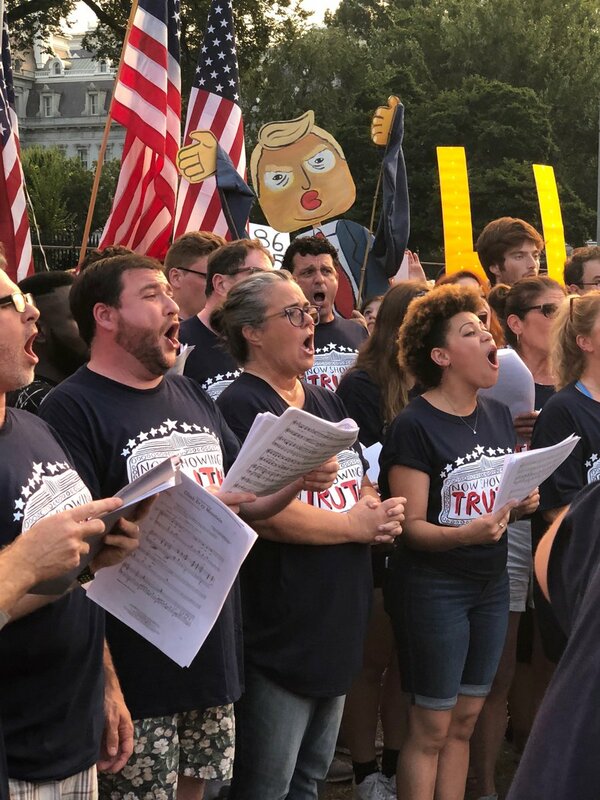 While much of America’s political class is transfixed by the debate about connections between Russia and the White House, a quieter but perhaps more consequential drama is playing out at Foggy Bottom. It concerns the startling diminution of Secretary of State Rex Tillerson and perhaps the entire department that he heads. Normally the most important position in the cabinet, the secretary of state has had little impact on the Trump administration so far. And, if anything, his role appears headed for further decline. The administration that promised to drain the swamp is draining Foggy Bottom. This, from The Daily Beast’s Lloyd Grove also offers some interesting insights. They are blaming the smaller plane on budget cuts. Just wondering what effect those cuts will have on embassy and consulate security. This passage is particularly ironic. Tillerson found himself being lectured on press freedoms during a visit to Bonn, Germany, last month by none other than Russian Foreign Minister Sergey Lavrov, the foreign policy czar of journalist-snuffing strong man Vladimir Putin. You might want to rethink canceling your subscription to The Guardian. The United States has four coasts subject to the perils presented by climate change: the Atlantic, the Pacific, the Gulf of Mexico, and the Arctic. As a nation with land above the Arctic Circle, we belong to the Arctic Council. When she was secretary of state, Hillary Clinton participated regularly in Arctic Council summits hosted by a variety of the eight member nations. This was one. I have bolded the list of member states. Lisa Murkowski was nice enough to post this picture on her Facebook page along with this comment about an hour ago. Heading home from the Arctic Council in Nuuk, Greenland. 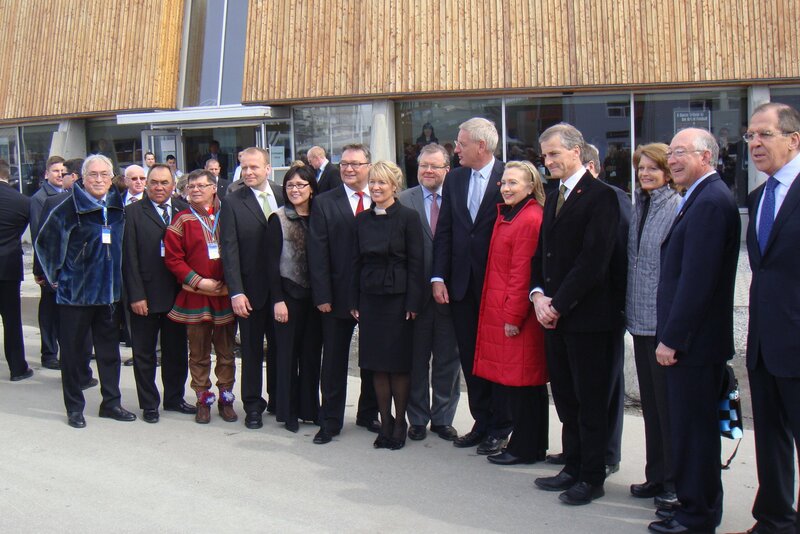 But wanted to share a picture: with the Ministers of the eight Arctic nations in attendance, as well as Secretary Clinton and Secretary Salazar. Here is a fact sheet released by the State Department about the Arctic Council meeting results. On May 12, 2011, Secretary of State Hillary Rodham Clinton joined representatives of the other seven Member States of the Arctic Council (Canada, Denmark, Finland, Iceland, Norway, the Russian Federation, and Sweden) in signing an Agreement on Cooperation on Aeronautical and Maritime Search and Rescue (SAR) in the Arctic (Agreement). The Agreement is the first legally-binding instrument negotiated under the auspices of the Arctic Council. It coordinates life-saving international maritime and aeronautical SAR coverage and response among the Arctic States across an area of about 13 million square miles in the Arctic. As Arctic sea ice coverage decreases, ship-borne activities are increasing significantly in the Arctic. Flight traffic is also on the rise as new polar aviation routes cross the Arctic air space in several directions. As human presence and activities in the Arctic expand, the potential for accidents increases as well. Limited rescue resources, challenging weather conditions, and the remoteness of the area render SAR operations difficult in the Arctic, making coordination among the Arctic nations imperative. The SAR Agreement will improve search and rescue response in the Arctic by committing all Parties to coordinate appropriate assistance to those in distress and to cooperate with each other in undertaking SAR operations. For each Party, the Agreement defines an area of the Arctic in which it will have lead responsibility in organizing responses to SAR incidents, both large and small. Parties to the Agreement commit to provide SAR assistance regardless of the nationality or status of persons who may need it. It is immediately apparent why there is a need for this council. Russia is a player. After Hillary left the State Department, she launched a series of speaking engagements. One of these was in Canada. Speaking to the Montreal Board of Trade last night, Hillary Clinton warned the audience of increased Russian activity in the Arctic and hung responsibility for another Cold War on Vladimir Putin’s doorknob. As Secretary of State, Hillary was an active participant in the Arctic Council and repeatedly echoed the message that we are an Arctic nation. The concerns she voiced in Canada are as much an issue for the U.S. as they are for Canada. Along with the disquiet she expressed regarding Russia’s activities in the north came further comments about recent activities in Europe. In light of the above, this is of some concern or should be to all the member nations including ours. The nuclear icebreaker Lenin, the pride and joy of the Soviet Union’s Arctic great game, lies at perpetual anchor in the frigid water here. A relic of the Cold War, it is now a museum. Anyone thinking that Putin is playing nice friendly reindeer games up there is, of course, deluded despite the “peaceful and cooperative nature of the Arctic Region” as stated on the State Department page. We should never trust Putin, as Hillary warned, especially when his military is involved. So this military build up is one thing to watch. It’s nice to have ice breakers available when you need them, and the Russians were very helpful the time the whales were trapped under the ice as portrayed in that Drew Barrymore movie. Those missile installations, though. No wonder we sent troops to Norway. The North Sea Route concept, characterized in the article as a mini Suez Canal, is an obvious business venture, but of course the real target is oil. Drilling in the Arctic is an enterprise popular with Republicans. Lastly, how the hell did “newcomer China” get into this competition? It has no land above the Arctic Circle. Or does it? Is it building synthetic islands up there, too? The new administration has a dangerously narrow view of China’s adversarial scope. It goes beyond trans-Pacific trade and artificial islands to expand its continental limit in the South China Sea and East China Sea. China has invested in significant “development” enterprises in Africa centered largely on resource extraction with tandem infrastructure upgrades benefiting their ability to move products for shipment and not benefiting local residents or their farms or businesses in any way. I don’t think I have ever heard Donald Trump say the word “Africa.” At the very least, China’s presence in the Arctic deserves a question. As for Russia, and its military push, we always do well to heed the warnings of Hillary Clinton. Merry Christmas, Hillary Clinton, and THANK YOU for THIS! Just before Christmas six years ago, Secretary of State Hillary Clinton rushed to the Capitol to see the Senate vote and ratify the New START treaty. The treaty was the result of hard work and long cooperation between her and Russian Foreign Minister Sergei Lavrov and their teams. Here is her statement from that day. Today the Senate took a great step forward in enhancing our national security by providing its advice and consent to ratification of the New Strategic Arms Reduction Treaty between the United States and the Russian Federation. I congratulate the Senators of both parties who worked tirelessly to ensure that New START was approved, and I thank all the Senators who voted for this treaty for their commitment to our national security. Once this Treaty enters into force, on-site inspections of Russia’s strategic nuclear weapons facilities can resume, providing us with an on-the-ground view of Russia’s nuclear forces. The information and insight from these inspections forms the core of our ability to “trust but verify” compliance with New START. A responsible partnership between the world’s two largest nuclear powers that limits our nuclear arsenals while maintaining strategic stability is imperative to promoting global security. With New START, the United States and Russia will have another important element supporting our “reset” relationship and expanding our bilateral cooperation on a wide range of issues. President Obama and Vice President Biden have been unwavering in their dedication to this treaty to both strengthen our domestic security and reduce the international threat of nuclear weapons. This day would not have been possible without their leadership or the efforts of Secretary Gates and Admiral Mullen. I also thank President George H.W. Bush and all the former Secretaries of State who added their support to this Treaty and worked to see New START approved. I and all my colleagues at the State Department look forward to working with our Russian partners to conclude the approval of New START in Russia, bring the Treaty into force, and deliver the global and national security benefits of New START. It was a wonderful Christmas present for all of us. It is a treaty and is in place. Thank you, Hillary, for this important agreement between the U.S. and Russia. We live in a safer world because of your work. Amicable relations between our countries rely on respect for treaties which both leaders have signed and both governments have ratified more than they do on congratulatory notes and mutual admiration between leaders. The Senate ratification was the final step in a long process. Mme. Secretary, we wish you and your family a Merry Christmas. Thank you for all of your hard work and this legacy of success in protecting us. Thank you for the effort you put into your campaign. We are grateful and are always here for you and with you. Happy Holidays to everyone here at Still 4 Hill! Thank you for all of your hard work this year, too! Another Ground-Breaking Endorsement for Hillary Clinton! Foreign Policy Magazine has never endorsed a presidential candidate. The dramatic contrast between the 2016 major party candidates has impelled the editors to break tradition. H/T to our pal “sam” for sharing this one. Foreign Policy is very familiar with Hillary Clinton’s qualifications having published about her regularly during her tenure at the State Department.